One of the things that sets the 24 Hours of LeMons apart from other races is the system of penalties for on-track misbehavior; you pass on a yellow or run someone into a tire wall, you get black-flagged straight to the punishment area. Once there, you can spin the Wheel of Misfortune to get your punishment (in addition to the 30 minutes spent sitting in the time-out corner while the good kids rack up laps), and you might get the Max Mosley, the Al Gore Jr., or maybe you'll even get off scot-free with the O.J. With the addition of me and Herr Loverman to the LeMons Supreme Court, however, you might have the option of a special penalty that will reduce your time-out interval... but it ain't gonna be easy! Want To Ensure Absolute Impartiality From The LeMons Judges? Before the Altamont race, our friends at Car-Freshner gave me a whole box of Little Trees to hand out to the racers. Fortunately, I still had about 50 of them left over. That's not enough to give one to everyone, so what to do? Why, make a punishment out of them, of course! 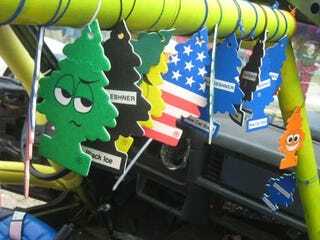 While one tree can give you a pleasant New Car Smell, fifty of them (all different types) in a single car is another matter entirely. We've dubbed this punishment the "Chemical Ali." The guys in this Fox Mustang got away with a hot-rod 302 built about of parts "just lying around the garage" and dodgy documentation of the money; we handed out a substantial lap penalty- which they managed to reduce by a donation of a case of beer to the LeMons staff- during the BS Inspection, but we were left with a nagging feeling that we were letting them off too easy. So, we resolved that we'd hit them with the Chemical Ali if they ever showed up in the penalty area with a Lousy Driving black flag. Sure enough, here comes the Mustang... and here come the trees! We could still smell the car five minutes after it returned to the track! Even with no windows, the scent in the car was overpowering. They were happy, though, because they only lost 10 minutes instead of 30. Stay tuned for Jonny's special punishment: the Diabetic Discipline!